The BattleKits line of robot kits is a great starting point for robotics projects like educational robots, industrial robotics, experimental robots, hobby robots, and robotic sports and competitions. BattleKits are designed along the lines of one of the most successful competition robots ever: BioHazard. We started with some of the key features in BioHazard and developed three rugged, low-profile, high-performance, mobile platforms on which you can build your next educational or sport robot. We feel that the above combination of features results in a kit that will save you countless hours and hundreds, (or even thousands), of dollars. We started with some of the key features in the design of BioHazard and improved upon them in several ways. "Kit" might not be the best word to describe our products. We ship them fully assembled, (except for electrical connections), so that you can go right to work adding your finishing touches. This preserves maximum versatility and flexibility. Start with our rugged, low-profile, mobile platform to simplify and reduce the time required to complete your project. BattleKits feature a bulletproof drive train that is completely housed in a square aluminum extruded tube. The one-piece extrusion (one each for the left and right drive trains), is precision CNC machined with mounting holes for all the sprockets, wheels, shafts, and motors. Each drive component is supported on both sides of the 3" x 3" square aluminum tubing to avoid "overhung" loads. The tubing is made from 6061-T6 aluminum alloy. The light weight robots have frame tubes with 1/4" wall thickness and the middle and heavy weights have tubing with 3/8" wall thickness. Drive train modules include a separate two-stage speed reducer for each wheel. All the drive chains are continuous loops with no connecting links. (Connecting links reduce chain strength by almost 30%.) All our kits feature #35 chain. The sprockets, shafts, and axles are custom-made from 5140 Chromoly steel. Two different sets of sprockets are available so you have your choice of medium-fast or very fast, (details below). One of our powerful Motors mounts on each drive module and is plenty strong for any ordinary robot. Our middle and heavyweight drive modules also have mounting provisions for a second set of motors if you are looking for truly extraordinary acceleration. 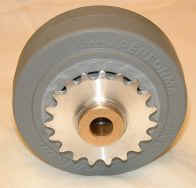 The wheel assembly is made from the popular 4" Colson Performa tire. These are machined and mated to our custom hubs, bearings, and 19-tooth Chromoly sprockets. This combination weighs in at just 1.1 pounds - including the drive sprocket. These are also available separately. Visit our wheels section for more details. The base plates and the bulkheads are made from 6061-T6 aluminum. The base plates are drilled and countersunk with all the mounting holes for the bulkheads, drive modules, speed controller, and several different sizes and types of batteries. All components are CNC computer machined to tight tolerances for maximum consistency and lowest cost. None of the sprockets hang below the bottom surface of the drive modules - not even the sprockets on the wheels. The screws are all countersunk on the underside so nothing protrudes from the smooth surface of the base plate except the rubber part of the wheels. 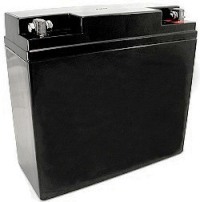 Battery Options and Mounting: We offer three different battery options. The batteries are held in place with steel mounting hardware that is bolted to the base plate. The base plates have been pre-drilled and countersunk for the hardware for each type of battery and for every optional battery location. To hold the batteries down onto the base plate we use 2" wide Velcro strapping. This combination of steel and Velcro makes for a very secure and low-cost mount while making it easy to remove the batteries for maintenance. Visit our batteries section for details. Tip Resistance: The wheels are positioned so that they stick out of the frame towards the front and the rear. This allows the robot to be tipped up onto its front or rear and still maintain contact between the drive wheels and the floor. You can decide to keep this feature or cover the wheels. The wheels are also positioned as close as possible to the sides of the frame so sideways tips will have to be quite extreme before the frame comes into contact with the floor. Another key feature is the low profile. The highest point on any of our kits (the bulkheads) is just 4.4 inches from the floor. This allows you plenty of room to mount your educational project or other devices on top of the kit's mobile platform without creating a robot that is unreasonably tall. A low center of gravity also makes it very difficult to tip the robot over. Ground Clearance: In place of the standard four-inch wheels, optional five-inch, 28-tooth wheels can be fitted to any of our kits for additional ground clearance. This requires drilling new axle holes and removing some aluminum around the wheels. Contact us and we will provide detailed drawings, or we can do the job for you at an additional cost. Shown on the left is the Light weight kit with 5-inch wheels. The ground clearance is increased to over 1.8 inches. Here is our 5-inch conversion kit if you already have a BattleKit and you want to make the switch. The only steel components in our kits are the sprockets, the axles, and small hardware. Everything else is made from aluminum. The following chart lists the size and weight of each basic kit along with the weight of the kits with our motors, batteries, and speed controllers installed. Note that the kits can be configured with many different motor and battery combinations. The combinations used in the chart are just examples. All the kits share the same wheels and speed reduction hardware. The light weight kit is the simplest and lightest possible 4-wheel-drive configuration using our custom hardware. It includes two dual-wheel drive train modules, aluminum bulkheads, and a base plate. The motors are located in the center of the drive modules and each wheel has its own two-stage speed reducer. The base plate is drilled and countersunk with all the holes required to mount the speed controller, batteries, and other components - a total of 62 holes. Weight with two E30-150 motors, two MC-1250 batteries, AmpFlow 160 controller: 37 Lbs. Visit our order page to place your order. You can order this kit with up to four motors and four MC-545 batteries installed. The square footprint works well for a many types of robotics projects. Note that four motors are not required in any of our kits in order to achieve four-wheel drive. All wheels will be driven even if only two motors are installed in the kits. But if you decide to go with the E30-150 economy motors, we suggest you use four of them in the middle weight. A total of ten chains are used for power transmission and speed reduction. The ten chains have no connecting links, and they are all exactly the same length. In fact, every chain in all of our kits is the same length, (except two chains in the heavy weight). This enables us to buy these in large quantities and reduce costs. All the kits also share wheels, axles, sprockets, shafts, and other hardware so we are able to take advantage of volume discounts on all those items. The base plate is drilled and countersunk with all the holes required to mount the speed controller, three sizes of batteries, and other components - a total of 84 holes. The Middle and Heavy weight kits can be configured with two or four motors. Ether configuration will provide four-wheel drive. Robots with just two motors employ a "jack shaft" in place of the second set of motors. The jack shaft is simply a shaft with two sprockets that runs in two ball bearings mounted in the aluminum drive module. Four motors are required in the heavy weight kit if you choose to use the E30-150 economy motors. The base plate is drilled and countersunk with all the holes required to mount one or two speed controllers, three sizes of batteries, and other components - a total of 92 holes. If none of our standard sizes will do the job, consider using our Modular Drive Units. With the "MDU" you can easily construct a mobile platform that is exactly the length and width you need. You can easily mount these modules into your robot by drilling and tapping four 1/4-20 screw holes right into the 3/8" aluminum wall. You can also mount other components directly to the module using more tapped holes. We left the hole locations up to you so that you would have maximum flexibility in mounting. The extruded aluminum frames are symmetrical so the motor can be mounted on either side. We call these "Type-A" and "Type-B". For a four-wheel drive robot, you would typically need two of each type. Just choose the types that you need on our order form. You can always reconfigure them if you change your mind. Like all our kits, no chain tensioners are used in the modular drive units. The axle locations are machined to such tight tolerances that chain tensioners are not required. This is one of our key cost-cutting features in all our kits. We reduced the parts count and the cost with no impact on the ruggedness. We tried to heed the advice of Antoine de Saint-Exupery when he said "You know you've achieved perfection in design, not when you have nothing more to add, but when you have nothing more to take away." But we made sure to temper our enthusiasm for that philosophy with Albert Einstein's advice: "Everything should be made as simple as possible, but not simpler." Reduction Ratios: These drive modules are available with either 5.6 or 3.4 to 1 reduction ratios, (the same ratios used in our kits.) The standard ratio uses sprockets with 9 and 24 teeth and the high-speed ratio uses sprockets with 13 and 21 teeth. To switch to the faster ratio you just replace the standard sprockets with our high-speed sprockets. Ten to twelve MPH is plenty fast for almost any type of educational or fighting robot so we ship all our kits with the 5.6 reduction ratio. Those who have had lots of driving practice at that speed might want to try the faster ratio so we offer a high-speed upgrade. We recommend using one of the "A" series motors with the high-speed ratios. The modular drive units (unlike our kits), are available with the high speed ratio factory installed.